With the “legal tampering” period beginning yesterday in the NFL, I’m sure it was a busy 24 hours for Jets general manager Mike Maccagnan working the phones, as NYJ boasts by far the most cap space in the league with an excess of $94 million at his disposal. Last week, I laid out every plan Gang Green should have at quarterback going into 2018 with the obvious first domino to fall in Kirk Cousins. I’m sure the Jets will make a hard run at the 29-year-old QB and hopefully can lock him up to a four or five-year deal with over $100 million in guarantees. It all comes down to the structure of the contract and getting him into the building. If NYJ can lock down a visit I like our chances. Obviously, a lot of the off-season plans revolve around Kirk’s future first and this wishlist is dependent on the direction the Jets go at quarterback. With Cousins under center, I would draft Quenton Nelson out of Notre Dame and sure up the offensive line. The Jets allowed the sixth-most sacks in the league and this unit needs to be revamped. As the league year officially begins on Wednesday at 4 P.M. here are who I believe Mike Maccagnan and the Jets should target in the coming days outside of the quarterback position. Why It Makes Sense: The Patriots to Jets pipeline continues as Butler could follow great DBs such as Ty Law and Darrelle Revis to suit up for both New England and NYJ. After an ugly ending that still hasn’t been explained in Foxborough, Malcolm should be eager to get back at the Pats twice a year and the Jets give him that opportunity. The West Alabama product can still play as he was tied for 13th in the league in pass breakups. We also boast a huge hole at the cornerback position that hasn’t been filled since Revis departed or his skills really departed him. Other big name CB targets could include Trumaine Johnson and Rashaan Melvin. Why It Makes Sense: A return for Robinson to Duval has been all but ruled out making him an unrestricted free agent on Wednesday. Allen should have numerous suitors vying for his services even though he is coming off a torn ACL. At such a young age his best football could still be ahead after a dominant 2015 season. I’ll be interested to see if he lands the long-term deal from a desperate team like the Niners or Bears or chooses to take a “prove it” one-year contract of sorts and do this all again next year. Why It Makes Sense: After notching a 1,000-yard season in Cleveland, Pryor took one of those “prove it” type deals which we mentioned above and putting it kindly, it didn’t work out up in Washington. I’m not jumping ship and a talented player could come in on a low risk move for NYJ. Maybe a change of scenery is all it takes for the 28-year-old and Cousins to connect? Why It Makes Sense: Newsday is already reporting the Jets are expected to pursue the former Giant early on in free agency. Richburg only turns 27 this year so a multi-year deal to sure up the center position makes sense. There are a plethora of linemen available at the top (Andrew Norwell) of free agency for the Jets to throw money at and it would be stupid to not sign at least one. Weston would come in as an immediate upgrade to Wesley Johnson, who dealt with the impossible task of Nick Mangold last year. Why It Makes Sense: Lewis had a great season for the Pats as he was a real difference maker on that offense so taking him away from NE would be a huge get for the Jets. NYJ hasn’t had a home-run hitting RB since Leon Washington broke his leg in 2009. We are in desperate need of one and I’m definitely open to taking Sony Michel, Derrius Guice or Ronald Jones in the earlier part of the draft. If the Jets go the free agency route look for them to consider Lewis, Jerrick McKinnon and Orleans Darkwa. Why It Makes Sense: The Bills did a great job retooling their back end and Tre’Davious White has all the makings of a potential stud. The lesser-known Gaines quietly had an efficient season (13th rated CB on PFF) and could come at a safer price than the big-name corners. Would also look at bringing in former Ram/Bill Nickell Robey-Coleman to play some slot corner as I’m just sick of seeing Buster Skrine committing penalty after penalty. Why It Makes Sense: The Jets haven’t had a true pass rusher since John Abraham left over a decade ago. They have tried to plug in veterans such as Jason Taylor and Calvin Pace over the years, but NYJ hasn’t been able to find the guy who is supposed to strike fear into opposing offenses (see Vernon Gholston and Quinton Coples). Okafor definitely has some potential, as he recorded 30 QB pressures in just 10 games in 2017 before his season was ended by an Achilles injury. Aaron Lynch from San Francisco could be an option here at just 25-years-old but hasn’t had a productive full-season since 2015. Why It Makes Sense: Moncrief makes for a very polarizing prospect and I’m interested to see the type of market he garners. Everyone knows the talent is there, but his numbers haven’t the last couple season just notching 300+ yards in each. If he gets in the right situation he could prove to be a bargain at just 24-years-old. I’m open to rolling the dice on someone like this or Jordan Matthews who is also just 25. 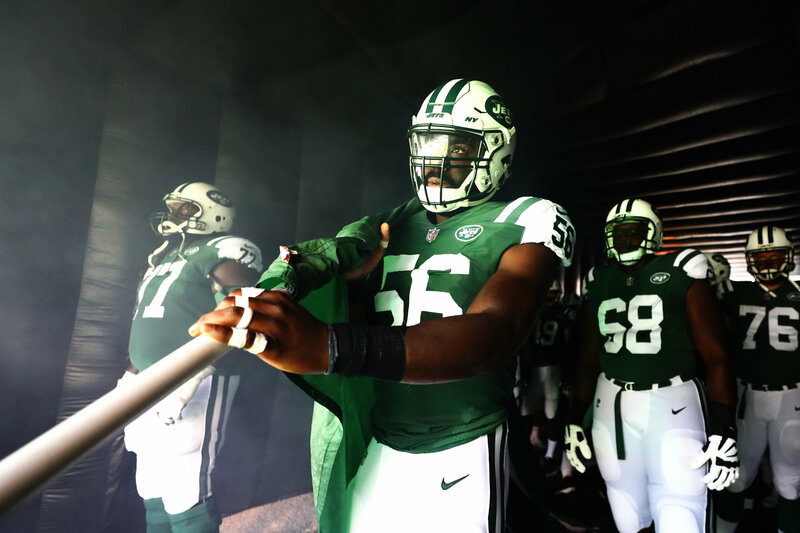 Why It Makes Sense: DeMario made his return to NYJ in a deal with the Browns and looked to be a completely new player from his first time around. He exuded leadership qualities, while being surrounded by a young defense. PFF has the former third-rounder as the top-graded linebacker available. The Jets should be open to bringing back the high-character Christian man. Why It Makes Sense: The 28-year-old enjoyed a solid first campaign, which had its ups and downs for the Jets as the leader of a secondary full of youth. Mo is definitely an option if the free agent market dries up quickly. The Jets should really sign a higher priced FA and bring Claiborne back on a cheaper contract. Why It Makes Sense: Ealy was a no-risk proposition when the Jets brought him in after the Patriots cut him during the summer. He was definitely inconsistent during the year and really faded down the stretch. I did become fond of his ability to gobble up passes and bat them down. He had to be among the league leaders even in his limited snaps. Why It Makes Sense: I really enjoyed seeing ASJ turn his life around and become a professional in his first year donning the green and white. He’s a huge body and actually has solid hands. He would’ve had a couple more TDs this year if refs weren’t trying to be heroes and overthink everything. The former Buc will definitely have a solid market so I wish the Jets got this done earlier, but give me some more of the 25-year-old Jenkins to build on his 50-catch campaign.